Are you a roofing contractor in Calgary and looking to get high-quality leads for your business? There are so many ways of approaching this but not all of them are equal. Why not go for something simple, clear and effective? Local ConneXtion is a way for you to communicate directly with clients, without having to spend as much as you would for other types of leads. Sometimes simplicity and directness is the best approach, and Local ConneXtion works on both those levels. This service allows you to bid on jobs which clients have posted in your area. The more personal and direct you are the more a prospective client is going to feel like you have an offer that they are looking for. The process works very much like providing a quote or an assessment, except everything is done online, and it is both easier and more convenient for you and your clients. If you’d like to register and start bidding on jobs today, click here. When you’re trying to find a roofer it’s important to explore your options. Even if you are just looking to quickly repair some hail damage you have to make sure you are working with a Calgary roofer that will provide the services you need. Sunk Roofing is a company that comes up when you do a Google search for Calgary roofers, and they seem to provide a great service. A company who is visible on Google and is getting positive reviews can be a great bet, and it looks like they work all through the year, which can be handy if you’ve delayed your roofing repairs to this late date. Another way to locate a roofer is through Local ConneXtion. This is a site that allows you to connect easily with roofers in your area. You post a job, detailing what you need. Roofers bid on it, telling you how they can help. It’s simple, and it ensures you find a roofer that will meet your unique needs. Calgary roofing companies: if you are interested in registering for this service and communicating directly with potential clients, click here. 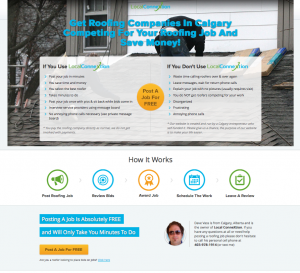 Are you a Calgary roofing company looking to get more roofing leads? Any local business owner knows that leads are the life-blood of any business. There are many ways of getting leads such as SEO, Google adwords, offline advertising, etc. But have you ever considered using Local ConneXtion? It is simple to use and free to register. Once you are registered you can bid on any roofing job on the website. The cost to bid is WAY less than what you would spend to get a lead from any other form of advertising. The key thing to remember is that Local ConneXtion is a way to help you connect with people in Calgary looking to get a roofer. The more personal you are with your bid, the more likely you are to win the job. You may think that only the lowest bid will win. That is NOT true at all. I have found from experience that the companies who take it seriously and actually spend time communicating with the customer win the bids. People don’t just look at price, they care about quality and how well the roofer treats them. To register and start bidding click here. Do you need to get your roof repaired or are you looking to get a new roof? Traditionally, you would spend a lot of time calling different Calgary roofing companies and asking them to give you a quote. The problem is how inefficient this method is for both you and the company you are calling. How do you stay organized with the different roofing estimates? How do you communicate with the roofer after he leaves the quote? Do you call him back? What if he doesn’t answer the phone? And what if the roofer is too busy to even swing by to see your house? Wouldn’t it be better if you could upload your job once complete with a title, description, and images and get roofing companies from Calgary bidding for it? The best part is that the roofing company can see your job from the pictures and give you an estimate. Only after you see the estimate do you have to give him your address (the serious stage) for them to finalize their bid. And all the estimates are organized in a central admin panel, plus all your communication stays in one place on message board. Get roofers from Calgary bidding on your job.